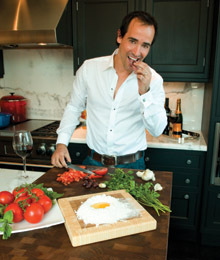 Tantalizing his viewers’ palates with mouth-watering dishes made with authentic Italian ingredients, David Rocco and his newly extended family escape to the Tuscan countryside for the next season of David Rocco’s Dolce Vita. If David Rocco were a dish, he’d be pasta al forno, because, he tells me, he’s crunchy on the outside, and soft on the inside. It’s a good comparison, since oven-baked pasta is covered in a crust of gold, which symbolizes the level of success he has received over the years.